“All budget years are tough. But this year was especially difficult,” Mr. Ban said in his remarks to the General Assembly this morning. “Governments and people everywhere are struggling. It is a time of global financial austerity,” he said, commending the Assembly for its willingness to make hard choices. Mr. Ban had initially proposed a budget of $5.197 billion in October, which represented a 3.2 per cent cut in the current financial plan, as part of adjusting to the current sluggish global economy. His proposed budget included a series of modifications based on efficiencies, improvements and investments, with a net decrease of 44 posts as well as cost-cutting for travel, consultants, general operating expenses, supplies, materials and equipment. The General Assembly examined and discussed all of these aspects over the past two months. The budget was among a host of resolutions adopted by the Assembly as it wrapped up its work for the year, which also included a text approving $583.38 million of the budget to be allocated for 29 special political missions for 2012. The Assembly also adopted texts on the culture of peace, the strengthening the coordination of UN humanitarian and disaster relief assistance, and assistance to survivors of the 1994 genocide in Rwanda, particularly orphans, widows and victims of sexual violence. 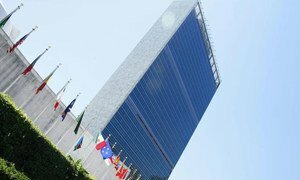 In addition, the Assembly approved funding of peacekeeping operations for the UN Interim Security Force in Abyei (UNISFA), the UN Mission in South Sudan (UNMISS) and the UN Operation in Côte d'Ivoire (UNOCI). Secretary-General Ban Ki-moon today presented a proposed budget of nearly $5.2 billion for the United Nations to carry out the important work that Member States have entrusted to it in areas ranging from peace and security to human rights and development over the next two years.